Good times! Do you have a good recipe for goose? I typically cook the breasts with sliced onion & peppercini's in a crockpot with a dark beer like Killian's or Honey Brown for about 8hrs. Then shred and mix with Sweet Baby Ray's BBQ sauce. Add a slice of PepperJack cheese and you've got a really great sandwich! I will also make jalepeno goose poppers. Wrap strips of goose breast meat around a slice of jalepeno and some cream cheese then wrap with 1/3 slice of bacon and skewer with a toothpick. Cook just until the bacon is done. Those recipes sound great....makes me want to go bust a few! 1-4-2018 , Indiana 11 pt. I killed with a crossbow. Missed a dandy the evening before with my bow because my release was frozen and misfired. Pulled the Barnett off the wall, sighted it in and got him that night. Great feed pattern with dozens of deer going by every night to feed. It was 3 degrees when I shot him. Brrrr! Excellent!! I hunted to the bitter end and didn’t connect. It was cold and I enjoyed being out. That is a great deer. Congats Greg! That area sure looks like a huge upgrade from typical February weather in Indiana! As a goodwill gesture to the ranch owner, the outfitter requests all meat be given to the cowboys who work there. 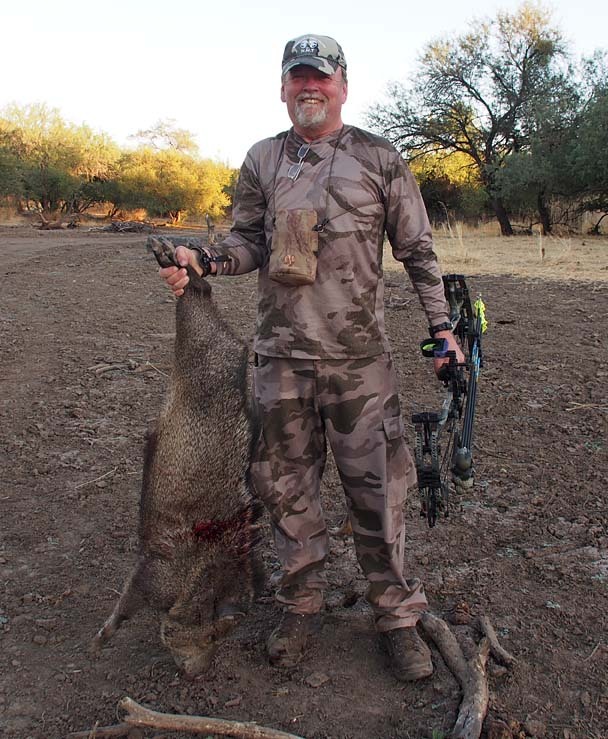 But it surprised me that they were all over that Javelina, and quickly had him skinned out and hung up that evening. They claim the meat is excellent, in spite of a general reputation to the contrary. I can easily see how a guy could get addicted to this wintertime hunting down south in the desert! Atta boy Mike! Followed your semi-live hunt thread on the main forum. Looked like a good time was had by all! Congrats! Nice, congrats on the big ol' porkers! Thanks guys. Pictures are too kind but the hunting was fun. Porkapalooza was a good time. Good thing Shiloh isn't closer or I'd be broke. BTW, the pork tastes great. Nice hogs! that looks like a blast! Thanks guys. Hey Pete. On the flat and climbing ladders no problem. Going up hills and squatting repeatedly, I can still feel the pull. Those doctors weren't kidding when they said it will take about a year. Thanks for asking. Way to go Paul....that didn't take long! Congrats to you both Pete! Father/Son double....special memory right there! Paul, your bird looks to be a good one: congrats! What were the weight, beard and spur details? Congrats on the nice tom Paul! I heard the whole story from my dad. Sounds like it was quite an adventure finding it. Also, I heard you have some good-natured ribbing in store for me regarding me killing before my wife did...lol. Hey Pete. Just an average tom....22lbs, 27mm spurs and a 10-1/2" beard. The spurs were sharp and curved...so I'm assuming a 3 year old bird. Finding my bird was an adventure. He really didn't go that far, but he did double back on me in the woods and I had no blood to follow. That makes two turkeys in a row I've shot with fixed blade heads and both recoveries made me nervous. Both arrows pretty much hit where I was aiming and had complete penetration. Both birds were dead on their feet, it just took longer for them to go down. You know I'm not a fan of shooting big game with mechanical broadheads....but I've pretty much made up my mind to switch back to big cutting diameter mechanicals for turkeys next season. Well the bird came in on Andrea's side first but decided it didn't feel comfortable and circled back behind us leaving. She was frustrated and said "don't let it get away!" So I made sure it didn't get away, lol. As far as Dad taking her, that was because I was commissioned to watch 3 kids the next day (a.k.a. the doghouse for shooting her turkey!). I guess Dad didn't want to end up with the same result so he let her shoot... Lesson learned: always do what your wife says but don't always do what she says...confusing I know. On the plus side we found twelve nice morels when we were walking out! "Listen to the woman." - by Wesley Snipes in the movie "White Men Can't Jump"
Ran down to Shiloh Ranch in Oklahoma to get my hog fix before I go back to teaching. Opening day of teal season. Rained all day but the birds didn't seem to mind. Doubled on one group. Nice! Looking forward to more hunt reports coming up soon! Nice shooting on some very fast birds, Mike! shot these 2 does 20 minutes apart on Tuesday after finding a waterhole that was well off the beaten path and far from other water. Dad got in on the action as well. Was hard to get him to hold out as the unit was target rich for his 270! Congrats to you and your dad, Pete! Nice job! Congrats to you and your dad Pete! Great hunt there Pete. DIY or guide? Any preference points needed to get a tag? Mike, sent you a PM. We went DIY and the unit took 5 points to draw and even then was not 100% odds to be drawn. There was no shortage of animals even with going out a full week after the rifle opener. Congrats on your first traditional whitetail! Photo didn’t want to rotate. I’ll try here. Real nice. That'll be some tender venison. Congrats! I got lucky and found a doe that needed a freezer home. I'll bet she didn't go far, congrats! Thanks Greg, Yep, she didn't go far at all. I heard her fall. Bounced off a few trees on the way down. Shot this buck 10/30 and the blood trail was sparse. Backed out and came back Halloween morning and found it. Got very lucky as there was little to no blood. Good job on the blood trail! I like how dark his antlers are! What do you think lead to the weak blood trail was it a fluke or placement? Try a new broadhead? Congrats Mike. Good job on the decision to back out and successful follow up! Autopsy revealed I hit the bottom of the onside lung and liver. Only one lung, Magnus Stinger 125 with the bleeders. I think a combo of low shot and lots of fat kept the bleeding internal. Broadhead passed through, found the fletch end still in the body. The next morning I was on the trail at first light. Found my initial spot of blood on a sapling (rain started in the early am). Crossed a small creek and on the opposite bank I found a spot that was about the size of 2 dinner plates with blood that looked more muscle than lung. That was the last of the blood. Started to follow the most logical path a wounded deer would take. Crossed into a corn field and then the end of the property. Turned back to take the next trail. Mother nature beckoned and right after I answered her call, I noticed the right side of the rack and the white throat patch in the woods. I had walked passed the buck by 15 yards but was looking in the opposite direction. Felt like divine intervention or Karma. Coyotes did a number on the backside. Got it hung up and to school before my first class started. Congrats Mike! Good job staying after it! My dad had success last night. He had to switch to a crossbow this year due to shoulder issues so this is his first deer with it. Shot was liver so we backed out and came back to find it this morning. It went about 400 yards before expiring. Congrats to your Papa Bas. How was the blood trail? Did it bed up or stay moving? The blood trail was not the greatest. It bedded once at about 100 yards then bedded the second and final time at about 400 yards. The last 200 yards was across a picked bean field and he died just off the edge of the field. Trailed him across the field mainly by his tracks instead of by blood. My cousin Fred Gill got a buck on the 8th and I got my buck today! Very nice.....some cool character on that one. Ended my season last Saturday. Not the biggest buck on the farm, but I'm a sucker for 8pts and this one gave me a slam dunk opportunity. Congrats on the sweet 8-pointer pav! Looks to be a good solid mature deer. I'll add my buck to the meat pole. Shot this one yesterday. Got lucky when he decided to do some cruising in the early afternoon. Heart shot him and he traveled about 30 yards before tipping over. I think those are his rubs in the background. I had a few trail cam pics of this buck, but this was my first live encounter with him. I felt very fortunate to be able to take advantage of it. Like I said, I'm a sucker for 8pt whitetails....and that one is definitely a beaut! Congrats to all! This year and last have been some of the best weather for rut hunting that I remember. Couple that with the later gun opener and it has been a perfect scenario for Indiana archers. Sorry for the repost but when I tried to edit the one picture that was upside down in my previous post, I deleted all the pictures and they would not let me add them again. Here are the pics from my post on the 11th above. Atta boy Greg! Really great buck and story. Congrats. Man, that is what I'm talking about!!!! Congrats Paul, Greg & Brent! Seems I can always count on your three and Mike to shoot nice deer every season! Great bucks Fellas! 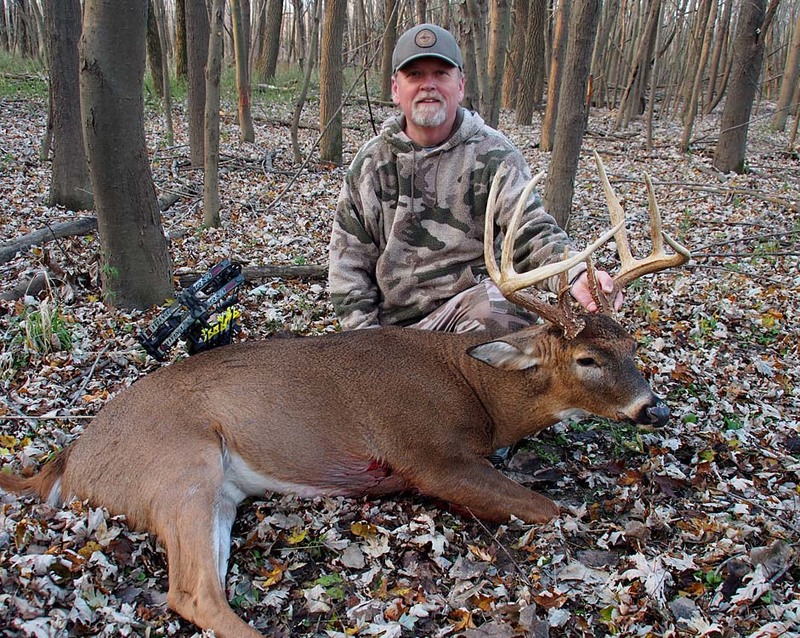 Dang good year in Indiana for big bucks getting killed during bow season. Congrats Kendall! Success with a bow is often underappreciated. An archery harvest is a trophy regardless of the size of the deer in my book. Congrats Jeff! Yep, after Oct. 30th, I've not seen a deer on the land I am hunting on. Very weird year. On the plus side, you got a lot of great meat right there. Way to go. Sorry for the tailgate photo. I already loaded him into the truck twice by myself and just didn't want to do it again. Not a giant, but he was the biggest to give me a shot in over a solid week of hunting during my annual IN deer hunt. I don't own a trail camera but my buddy does and he caught the buck on camera. Congrats to all the successful bowhunters! No worries Terry.....that beautiful takedown in the photo trumps the tailgate! Nice buck & a sharp looking bow! Well the deer hunting has been slow so I picked up the shotgun and some buddies and put a dent in the local mallard population. I can only claim a pair of drakes and half a goose. Pluck the breast, then working from the wing area up and across the breast plate to the other wing area take the breast meat off in one piece with skin. Marinade in zesty Italian for 4 hours. Salt, pepper, minced garlic, paprika and drizzle with a little honey all on skin side while cold (so honey doesn't just run off). Sear the skin side first then the other side. I seared them both for about 2 minutes (a little longer for geese). Then finish by baking in oven for about 15minutes at 300 or until finished to your liking. This allows you to get the meat to temp without overcooking - which is the death of any waterfowl dish. Thanks Pete! Sounds pretty good. Might have to give that a go with the next batch of birds. 2018 has been pretty good. Here is a sampling in one photo. Missing a turkey in the photo and many more geese. Lots of fun and memories with friends and family. Congrats to everyone else on a successful year. Wow Dec, that's pretty impressive. Congrats on your season! Way to go Pete! Congrats. Good luck on getting that buck. Ran down to Shiloh Ranch in Oklahoma with a couple of buddies and a few Bowsiters (Boothill from Kansas and Bad Karma from Colorado). 17 yard broadside shot and spined the sow. Congrats on the fall bird Pete....not easy to do. I'll bet that one will eat good too! Nice one Mike....you guys seem to get 'er done out there every time!